If you are thinking of visiting us and you would like to check availability please use our booking enquiry form by clicking on the link. 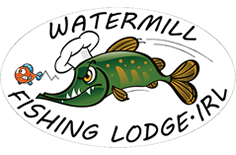 Watermill Fishing Lodge Family - A fantastic team put together by the passion of fishing. Valarie: In Ireland, fishing is not Pascals only love. Valarie 20 years of experience of welcoming people in the restaurant business. Marine: A top class handy man, if you need anything, ask Marine! He is also a very good fisherman. Mark: Our resident boat mechanic angel. Always on call in any part of the lake at any time of the day, in any weather! We are so lucky.